These 3 types represent a trinity: they cannot exist without each other. You must keep at least one piece of each type on the board at all times. In other words, the first way to win is to make your opponent run out of either Tzaars, Tzarras or Totts. 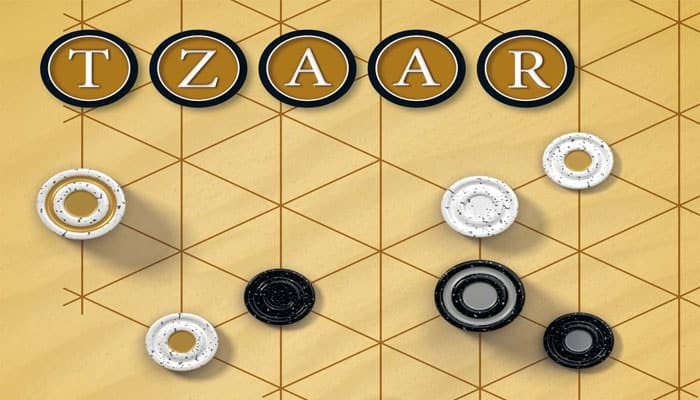 Each turn, players are obligated to capture at least one opponents piece. So the second way to win is to put your opponent in a position where he cannot capture any of your remaining pieces on the board. Diagram 1: the 3 different pieces, from left to right: Tzaar, Tzarra and Tott. Place the board between the players so that the long side runs from one player to the other. Put all the pieces randomly on the board. The intersections constitute the play area and are henceforth referred to as spaces. When all 60 pieces are on the board, all spaces will be occupied. Draw lots for your color. White begins. Note : If you do not like to begin with a random start position, see points H. and I. below. To begin the game, White makes one move. White must use this move to make a capture. 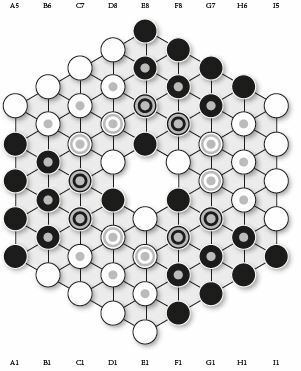 The rules for capturing are very simple: pick one of your pieces (of any type) and move it to an adjacent space with an opponent's piece (of any type). Take the opponent's piece from the board and put your piece in that space. The opponent's piece goes out of the game. 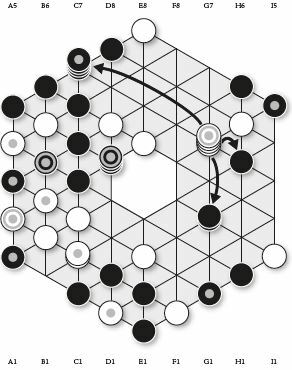 After White has started the game with only one move, players always have two moves per turn. The first move is always a "forced capture". You must capture! You can capture a piece in an adjacent space, but during the course of the game more and more spaces will become vacant. 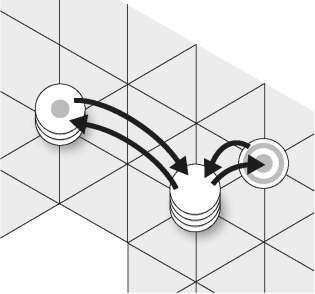 You may also capture by moving a piece in a straight line over any number of vacant spaces, to the first space occupied by an opponent's piece. Take the opponent's piece from the board and put your piece in that space. (See diagram 2). The opponent's piece goes out of the game. As far as capturing goes, there's no difference between Tzaars, Tzarras and Totts. Each piece can capture any other piece, as long as the piece is at least equally strong as the piece it wants to capture. The strength of a piece is not determined by its type, but by its height. In the beginning there are only single pieces, which means that all pieces on the board are equally strong. But you can make your pieces stronger during the game by stacking them on top of each other. A stack of two pieces can capture any single piece and any two-piece stack of the opposite color; a stack of three pieces can capture any single piece, any two-piece stack, and any three-piece stack of the opposite color, and so on. All pieces on the board move the same way. A single piece is as movable as a stack of two, three or more pieces. 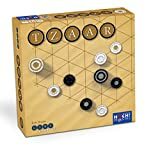 Diagram 2: the arrows indicate which black pieces can be captured by the white Tzaar. To make a second capture, the rules are the same as for the capture with your first move. You may make the second capture with the same piece (or stack) that made the first capture, or with a different piece (or stack). To make a piece (or stack) stronger, you just have to jump with it on top of another piece (or stack) of your color. You may jump on one of your pieces (or stacks) in an adjacent space or in a space that you can reach by moving in a straight line over any number of vacant spaces. So to make a piece stronger, you have exactly the same movement possibilities as for capturing. There is no limit to the number of pieces that can be in a stack. No matter how high, a stack is always considered as "one entity". It must always be moved as a whole and captured as a whole. Any of your pieces or stacks can jump on any of your other pieces or stacks. For example, a single Tzaar can jump onto a stack with a Tott on top and vice versa. (See diagram 3). Only the top piece of a stack counts for the different types of pieces in play. For example, if you put a Tott on top of a Tzaar, the stack counts only as a Tott (although the Tzaar is still in play as part of the stack). Diagram 3: a single piece can jump onto a stack (ofany height) and vice versa! Also, stacks can jump on top of each other. You are not obligated to use your second move. If you decide to pass, you just tell your opponent that it is his turn again. Note: you can never pass the first move (i.e. the forced capture) of a turn! A piece (or stack) can never be moved to an empty space. Once a space is empty, it remains empty until the end of the game. A piece (or stack) can never jump over one or more other pieces (or stacks). It can only be moved over vacant spaces. The board has no central space. Pieces may not be moved across the center. Stacks can only consist of pieces of one and the same color. You must respect the order of moves: always the forced capture first, then a choice between three possibilities for the second move. You win the game when you succeed in capturing the last piece of one of the three types of your opponent's pieces, or when you put your opponent in a position where the opponent cannot use their first move to make the forced capture. Reminder: only single pieces and the pieces on top of stacks count when checking for the presence of the three types of pieces. The pieces in the stacks do not count. Diagram 4: fixed start position. 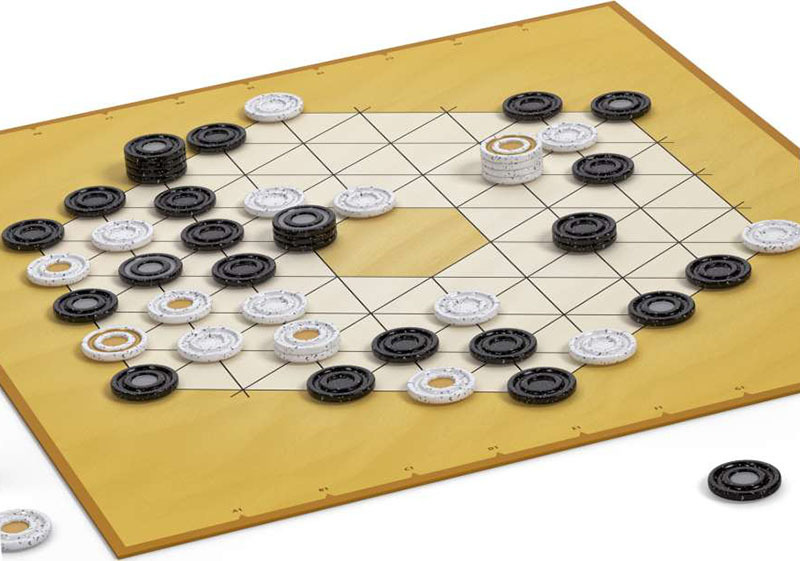 When playing the tournament version, the game begins with an empty board. The players take turns putting one of their pieces after another on the board. The pieces may be placed on the board in any order and it is allowed to switch from one type of piece to another as often as you want. 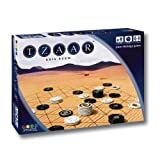 When all pieces are on the board, all spaces will be occupied and the game starts according the rules described above.